This year I decided it was time to start entering the Alaska State Fair. I’ve entered multiple County and local fairs for handcrafted items over the years growing up but not at the state level. It was time and my hard work paid off this year in the form of a first place ribbon on one of my nicest items I’ve done yet… Little Bo Peep and her Sheep otherwise known as Kitty Collier and Tiny Betsy. When I find some time I’ll post the photos of them at the fair with their ribbon. The judge’s comment on my form was “cute sheep girl” and I do have to admit Betsy is cute! 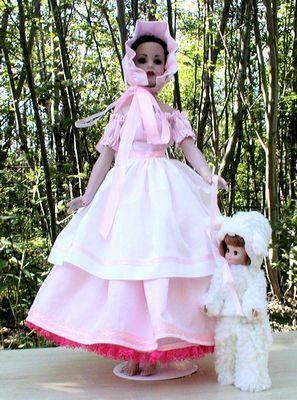 Both patterns appeared in the Halloween Issue of International Doll Magazine (No longer published).